If you've read some of my older blogs, you've seen me review some of the work of a terrific British artist who's worked on some of the Marvel UK line and made his presence known at many a Transformers convention overseas. His name's Simon Williams, and he recently drew a story scripted by Simon Furman, another Brit talent of some renown, featuring the incredible Hulk in mortal combat with a character that not every Marvel fan on this side of the Atlantic knows/remembers: Death's Head! I had some familiarity with the character before hearing about his return in the pages of this month's Marvel Heroes #33, so I didn't go into the interview or the Soulman Inc. Sketchbook review totally cold. He guest-starred in an issue of Walt Simonson's Fantastic Four run that featured a cross-time jaunt, and he'd also appeared in Sensational She-Hulk when I was reading that book. There was a Marvel Comics Presents story I'm pretty sure I barely glanced at (preferring to read that "Weapon X" feature by a chap named Barry Windsor-Smith...heard of him, yes?) as well as an issue of What If...? that told of what might've happened had the character not been reborn as Death's Head II. 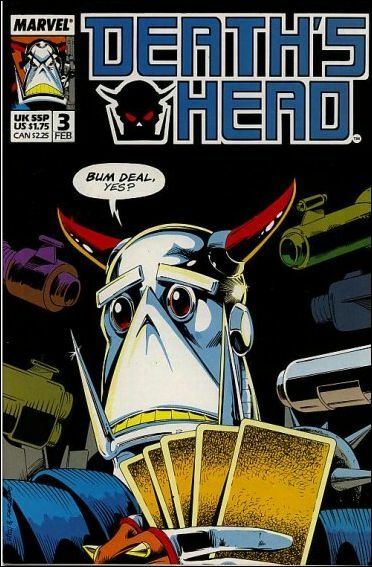 And as for Death's Head II, I vividly recall grabbing up the first four issues of his second, regular series, as well as the first issue of the reprint series The Incomplete Death's Head, before going back to the back issue bins for the four-issue miniseries by Marvel's UK imprint that destroyed the first Death's Head and integrated him into the Minion cyborg. I never picked up the series after that, and don't even mention the other spin-offs like Die-Cut and Death3 (even if they were written by a then-unknown, pre-Annihilation Dan Abnett). 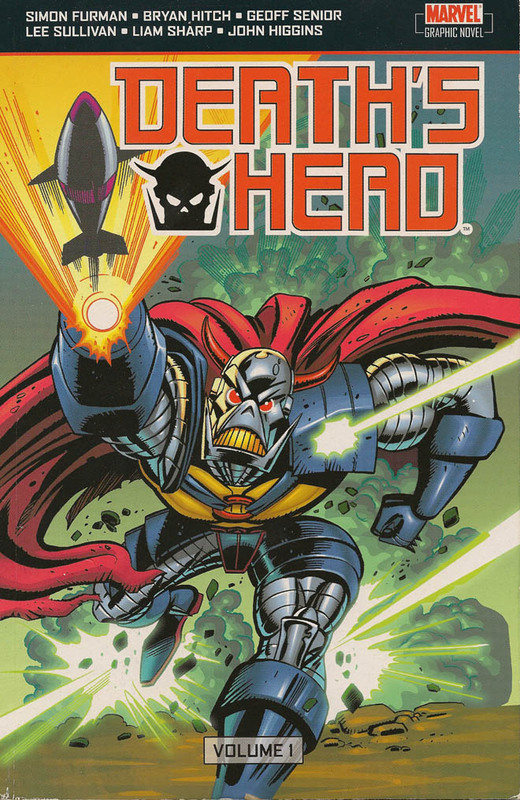 You may have picked up from the above that Death's Head, the original character, was imported to these shores from Marvel UK, and it's from the UK (and the Book Depository website) that I ordered the two volumes I'm reviewing this go-round, Death's Head Vols. 1 & 2 (Panini Publishing, £14.99 ea.). The two books, released in 2006 and 2007, cover almost the entire span of the character's career, from his introduction in the one-page story "High Noon, Tex!" by Furman and future superstar Bryan Hitch (now notable for The Ultimates); through guest appearances in Doctor Who Magazine and Dragon's Claws; ten issues of his own eponymous series and a graphic novel, The Body in Question; and finally several guest-appearances, many of which I mentioned as my earliest exposure to the character. The set, sadly unavailable in the United States (unless, of course, you order from overseas), is truly the best--nay, the only--complete resource for fans wishing to learn more about this most worthwhile character. 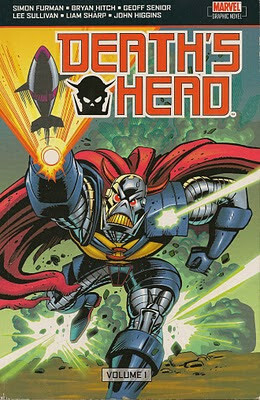 Death's Head resulted from Transformers writer/artist team Simon Furman and Geoff Senior's push to introduce more characters for their series. 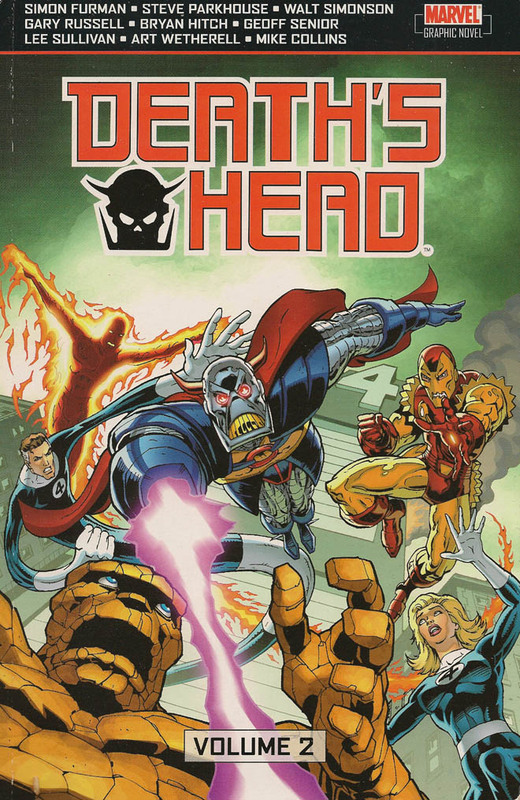 As result of Britain's weekly schedule as opposed to Marvel US's monthly one, Marvel's UK office had to generate many more stories than its American counterpart. Originally Death's Head, dreamt up as a bounty hunter charged with finding and eliminating the evil Transformer, Galvatron, was to have been a one-off character, but Senior's off-kilter design sparked something in Furman's imagination, and a cult legend was born! 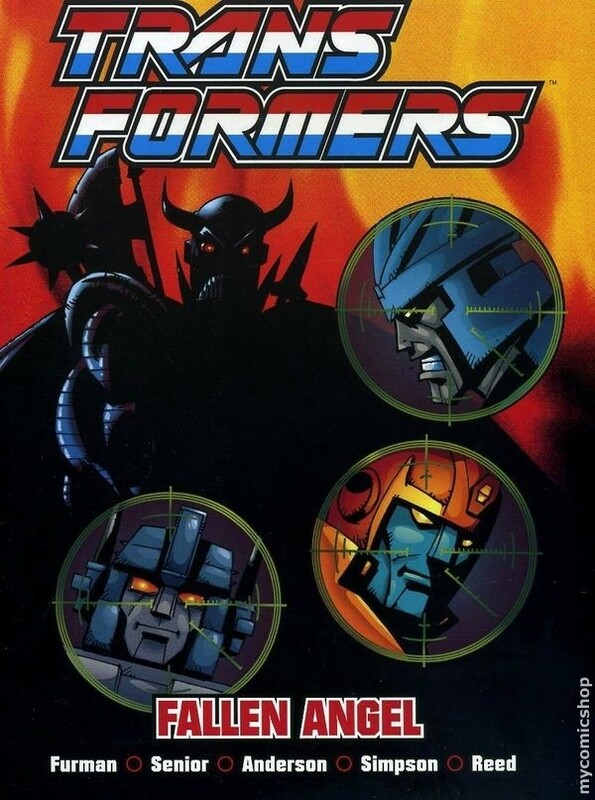 Not wanting the character to become absorbed by Hasbro, the owner of the other Transformers characters, Furman introduced the character before his first appearance in Transformers in the aforementioned one-page strip, "High Noon, Tex!" assuring that Marvel would keep the copyright. 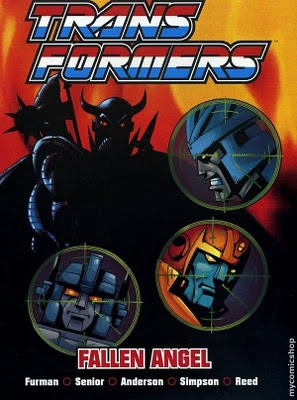 The then-giant robot appeared in two major Transformers story arcs beginning in issue #113 and continuing intermittently through #151, both of which can be found in Titan Books' collections, Fallen Angel and Legacy of Unicron. I actually have yet to finish reading either volume, so I can't speak for the quality of the stories...however, knowing Furman and Senior's work elsewhere, it's certain to be excellent. In his next appearance in Doctor Who, the time-traveling Doctor tricked Death's Head, reducing him to human size so that he could interact with the rest of Marvel UK's properties, the first of which was the elite law-enforcement team Dragon's Claws, based in the year 8162 and also created by Furman and Senior. From there, Death's Head landed his own series, and the legend began in earnest. The stories in Death's Head Vol. 1--collected in the US only partially in the trade paperback The Life and Times of Death's Head and in totality albeit with various unnecessary framing sequences in The Incomplete Death's Head--are a profoundly interesting showcase for the character, who never fails to get into lots of trouble. Chiefly by Furman and Hitch, the stories begin in 8162 in Britain and proceed forward, first to Los Angeles of the same time period, where Death's Head sets up something of an office, taking odd cases. Then thanks to another timely intervention by the Doctor in the first adventure in Death's Head Vol. 2, he's sent backward through time to the modern era (c. 1988) where he encounters the Fantastic Four and is then pingponged forward through time to meet Arno Stark, the Iron Man of 2020. After his series is over, he again travels through time to meet his maker, and then goes from time period to time period in various guest appearances. To appreciate Death's Head, it certainly helps to have a warped sense of humor, as the character himself wallows in dark humor, from his observations to merely his normal speech patterns (ending nearly every sentence in "yes?" or "huh?"). He has a partner, Spratt, he doesn't want, and together (more or less), they find themselves involved in outrageous situation after outrageous situation, with disastrous/hilarious consequences. For example, in issue #4 Death's Head is hired to kill Plaguedog, a bio-engineered killer dog kept by mob boss Undertaker, by Undertaker's competitor Dead Cert. What he doesn't know as he infiltrates Undertaker's place is that Plaguedog has actually been sent to his new office, where Spratt has decided to take in the new surroundings. Hilarity ensues, and the adventure earns Death's Head a new enemy in Undertaker, who appears throughout some of the remaining issues. The art in both volumes is by a who's who of British talent, from co-creator Geoff Senior, to Bryan Hitch, to Lee Sullivan, Liam Sharp, John Higgins, Art Wetherell and Mike Collins. Of them all, Senior and Hitch seem to have the firmest grasp on the character's mannerisms, but that's probably because they're the longest-tenured artists on the strip. Senior's art in The Body in Question, the Death's Head origin story, is near-revelatory, with terrific layouts and eye-popping colors. It's clearly the centerpiece of the second volume and perhaps of the entire series. A graphic novel is only as good as its presentation, and Panini earns mixed marks here. While the books are sturdy and heavy--certainly sturdier than Marvel's US collections--the reproduction sometimes falters, and it's a problem I've had with their previous publications, as well. It's very apparent that with a handful of exceptions near the end of the second volume, virtually every issue has been scanned directly from hard copies of the actual published issues rather than reproduced from any original films (if, in fact, any films exist). Often one may see the ink reflection from a facing page, or some hint of the art from the other side of a page. It's distracting but not necessarily a deal-breaker. The reproduction still looks very good, with The Body in Question an obvious standout. Panini rounded out the package with a set of terrific, lengthy introductions by creator Simon Furman, and capped off both books with new artwork courtesy Geoff Senior, Lee Sullivan, Dave Roach, and Simon Williams (whose colorist Jason Cardy provides the best gag with Death's Head's gun, upon which is stamped an arrow pointing at the barrel with the words "Toward Enemy, Yes?"). I read both volumes of Death's Head over one weekend and I have to say, I understand the appeal and look forward to reading that Hulk/Death's Head story that was published in the UK last week. (Hint! Hint!) If you haven't read Death's Head's adventures before, well, I suppose the only question I have to ask if you've made it this far is, "What's stopping you, yes?" Glad you enjoyed the Death's Head stuff, Gary... looking forward to reading what you think of the DH/Transformers trades. Simon, I fixed the article to acknowledge Jason Cardy. Thanks for pointing that out! Gary,you forgot to mention Death's Head recent appearance in the S.W.O.R.D. mini series of 2009-2010. This is supposed to be the earliest appearance of Death Head's lifetime. It is a good story. Comic book database says he also a recent appeared in Avengers and the Infinity Gauntlet issue 3. I haven't read that yet.